Unlike the standard glass envelope lamps used since Edison, the LED will not break when dropped. The life expectancy is well over 5000 hours. The light emitted by the LED (light emitting diode) is similar to sunlight and travels farther underwater than the more yellow light from an Edison lamp. 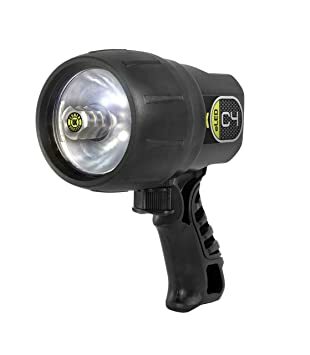 In addition a power control circuit is built into the light to help maintain the same brightness throughout the discharge of a set of batteries. A tough O-ring sealed ABS and polycarbonate case protects the components all the way down to 500 feet. The small size of the C4 eLED® makes it ideal for revealing the incredible marine life hidden under ledges. It starts with a unique dual power electronic circuit to control the matched pair of 3-watt white LEDs. Polarized battery contact plates make it possible to interchange individual battery cells and rechargeable packs as well as prevent potentially dangerous reverse battery insertion. The rubber lens guard, non-breakable locking switch and interchangeable handles are examples of diver hardened construction throughout. The C8 eLED is the brightest in its class, perfect for piercing the darkness and looking into the great unknown. Great video starts with great lighting. The Aqualite is the perfect companion for the GoPro user looking to improve the quality of their films. This powerful light offers a smooth, wide-angle beam that can be adjusted with 4 brightness settings so you can add just the right amount of light to your shot. 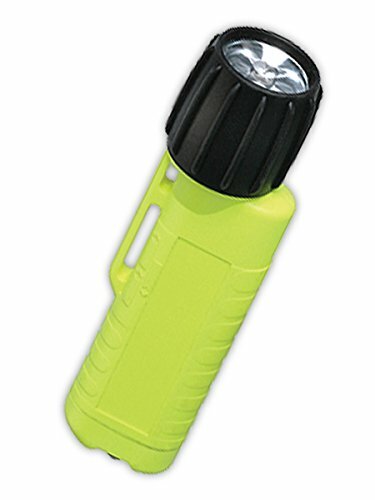 Waterproof to 150 m, and rechargeable via a USB cable, this light is made to go with you anywhere! Underwater Kinetics 10001 Low Voltage 120V/220V Breaker Lockout kit features a phase or lower circuit breaker panel board. 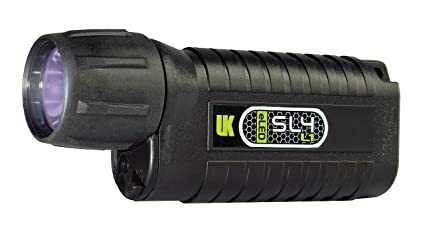 The UK SL3 eLED dive light will give you the most lumens for your dollar. 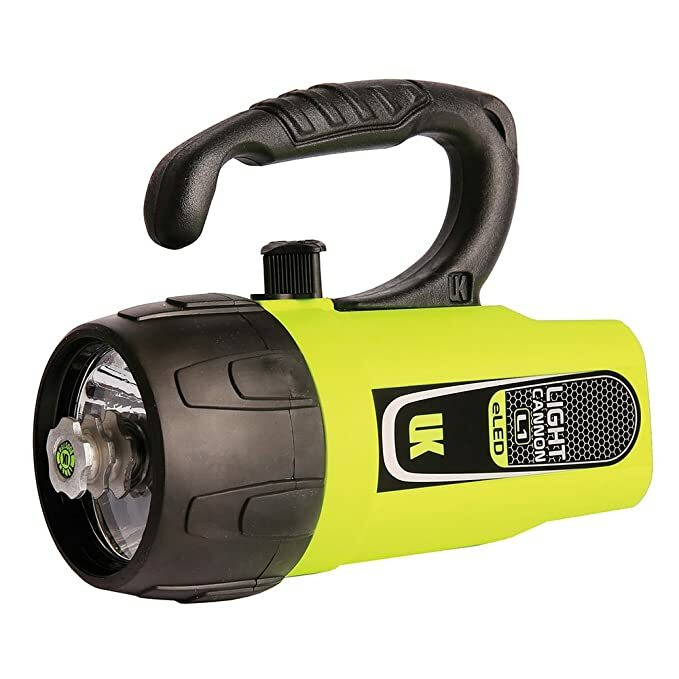 Take it with you on vacation to look under ledges and into cracks along the wall or use it as a back-up or secondary light for more advanced diving at night or into wrecks and caves. It is powered by 3 disposable alkaline c-size batteries so you do not have to worry if it has been charged and it works where electricity is not always available. 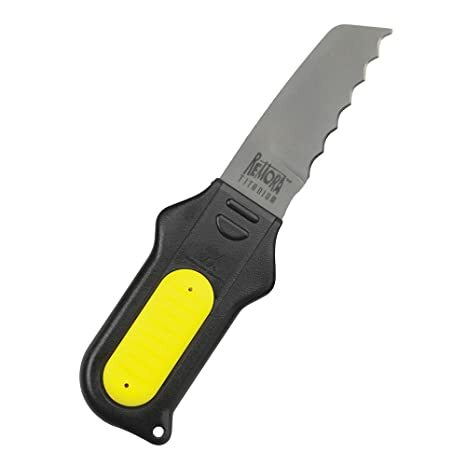 Small size, attachments for belt, hose or fabric and no maintenance design make the Remora the emergency knife for all divers. Length: 7″ Total. The Seratted knife cuts through rope & fishing line . The Light Cannon eLED delivers and even brighter illumination and maintains this brightness throughout the battery life. The beam is wide enough for scanning the reef at night or exploration of the interior of a wreck. Light from the eLED is close to the sunlight in color and travels further through water for maximum visibility. Non-breakable locking switch prevents accidental actuation. Dovetail slot for either pistol or lantern grip as well as photo arm. Front lens protected by heavy rubber boot for drop protection. Tough, non-corroding aBS and polycarbonate plastic construction. Rubber sleeve lanyard included. 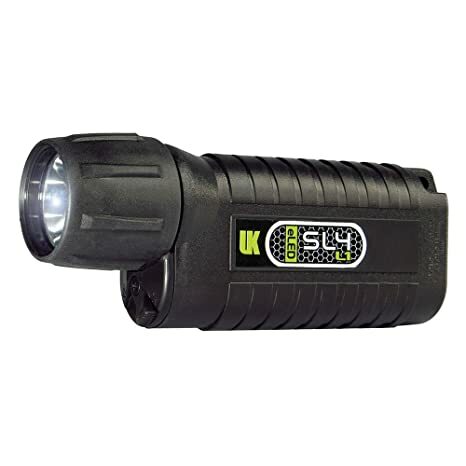 Powered by disposable alkaline batteries or rechargeable UK NiCad upgrade kit. Also uses individual NiCad or NiMH C-size batteries. Unlike the standard glass envelope lamps used since Edison, the LED will not break when dropped. The life expectancy is well over 5000 hours. The light emitted by the LED (light emitting diode) is similar to sunlight and travels farther underwater than the more yellow light from an Edison lamp. 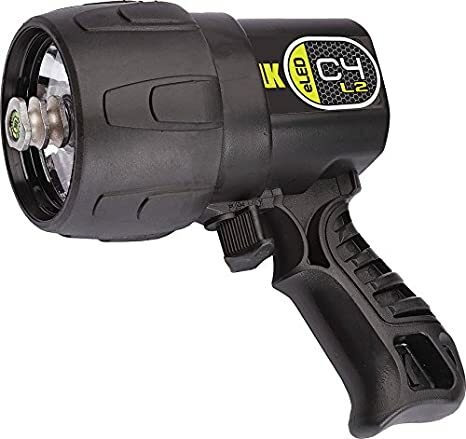 In addition a power control circuit is built into the light to help maintain the same brightness throughout the discharge of a set of rechargeable batteries. A tough O-ring sealed ABS and polycarbonate case protects the components all the way down to 500 feet. The small size of the C4 eLED makes it ideal for revealing the incredible marine life hidden under ledges. UK’s C8 eLED has been a favorite for divers around the world for years. 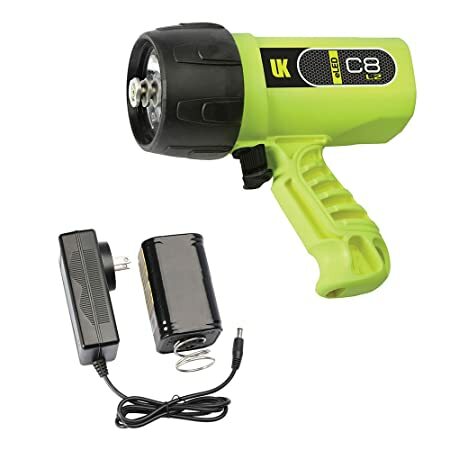 C8 eLED L2 takes the power and reliability of the original light, and amps it up. 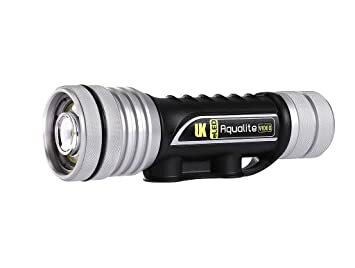 Putting out an impressive 1200 lumens with the optional rechargeable battery pack (and up to 900 lumens with alkaline batteries), the L2 more than doubles the output of its predecessor, while keeping everything you loved about the original. 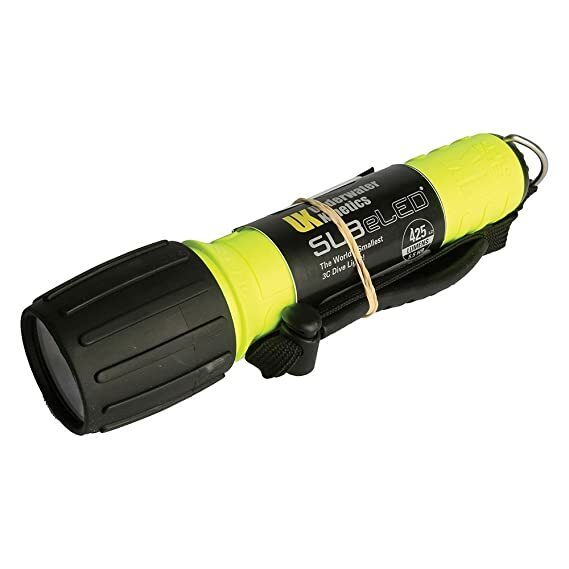 The C8 is an essential waterproof dive light for scuba enthusiasts everywhere. Made with non-corrosive materials, and including a new tough rubber bezel for impact resistance, the C8 will be with you for years. 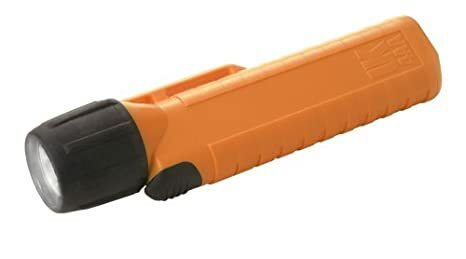 The long-life airline safe rechargeable battery pack will last up to 10 years with proper care, and the tough composite body will not corrode even after 20 years of salt water use. 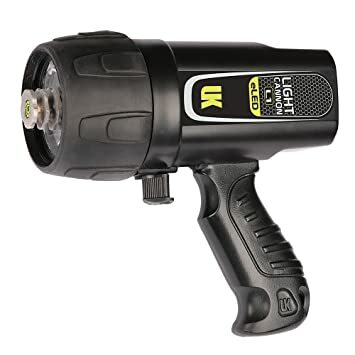 Featuring UK’s peak beam lumen techonology, which concentrates 90 of the lumen output into the center of the beam, minimizing glare and backscatter, and maximizing seeing distance. Safety matters don’t dive without the Blue Tang Titanium Knife. Getting caught in netting or fishing line is a dangerous and common occurrence. The Blue Tang Titanium is designed with a line cutter hook at the base of the blade to help you easily cut through any entanglement. It is sharp, corrosion resistant, and holds an edge longer than stainless-steel. The non-corroding solid titanium blade combined with straight and serrated cutting edges on a 5″ (12.7 cm) blade and heavy-duty pommel end cap for signaling like a tank banger all make this one multi-tool functional knife. The knife measures (L x W x H) 10.0″ x 2.15″ x 1.0″ (25.40 cm x 5.46 cm x 2.54 cm) and weighs 7.1 oz. (201.28 g). The knife blade has a drop point tip design. The knives, rubber ergonomic handle with extended thumb guard on the hilt fits comfortable in your hand. 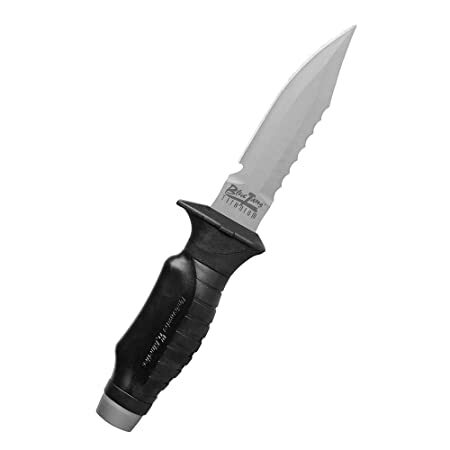 A quick release sheath has a locking mechanism on it, so the knife won’t fall out underwater or stab you. Sheath allows one hand insertion and comes complete with ozone resistant quick release leg straps. All this make this the best all-around diver’s knife. It is the ultimate in salt water corrosion resistance and has a keen edge, incredible strength, and a design that is unique for diving knives. Knife is available in multiple color and comes with a user manual.